Betty Monkman joined the staff of the White House Curator’s Office in 1967. Monkman later served as the Chief Curator of the White House from 1997 until 2002. Betty Monkman was interviewed for the Gerald R. Ford Oral History Project on Nomveber 17, 2009 by Richard Norton Smith. 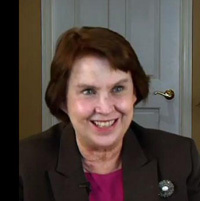 Betty Monkman was interviewed for the Gerald R. Ford Oral History Project on November 17, 2009 by Richard Norton Smith. Smith: When did you first come to the White House? Monkman: When did I first come to the White House? I came in early 1967, sort of at the end of the Johnson administration to work in the curator’s office. Smith: We all have seen the pictures, the demonstrators and everything else – was there a sense of an embattled climate? Monkman: Yes, and I think more so even into 1968. In early ’67 there wasn’t, but certainly in ’68. I remember standing in the Usher’s office, looking out at a protest in Lafayette Park, and I remember there were some agents, some Secret Service agents and people there. And they said, “Oh, those Commie students…” And I said, “Well, they could be your children,” because I was of that generation. I was only twenty-five or something. I was of the generation of a lot of those people out on the street. So, yeah, I did become more – I felt that even after 9/11, but it became more insular, I would say. And especially with the huge demonstrations, when the buses were surrounding the White House with the Vietnam protests and things. Smith: Now, that’s I think in ’69 with the moratorium – there was October and November of ’69. Monkman: Yeah, that was Nixon then. Smith: We’ve seen footage, in fact, we aired footage as part of the C-Span series. I think there were paratroops, literally under the old EOB. Monkman: We had Army troops under that passageway in back. Our office was right opposite the diplomatic reception room on the ground floor, and there is a long corridor underground for the kitchens and where the more utilitarian spaces are. And there were, at times, even after Martin Luther King died in that spring of ’68, we had troops stationed under there and we’d walk out of the office and there would be these armed troops right there. And even during tour hours people were concerned that there would be protests in the House. And it wasn’t just the war; it was the Center for Creative Non-Violence, which was a homeless shelter here. They would literally come in the House with – and this was long before security magnetometers and things like that. But I remember one time people came in with vials – we didn’t know it until they started opening them up and throwing them – but whether it was blood or red paint, or whatever it was, they would be in the State Dining Room on the tour and they would open these vials and all this red fluid would come out. Or they would bring in cockroaches and let them go. So we had to train the housekeeping staff on what to do if some of these situations occurred. But, yeah, it was a big time of protests. Huge. I stopped telling people where I worked. People would say, “What do you do?” I’d say, “Well, I’m a curator in a historic house,” and they’d say, “Oh, where?” And I would say, “Well, I work for the National Parks Service.” I was young and you’d go to parties and everybody took their political things out on you. If I said I worked for the Johnson or the Nixon White House – whew – I just got every bit of verbiage that people wanted to expend. So I stopped telling people where I worked. Smith: Was it different or basically pretty much the same in terms of people projecting on you whether it was the Johnson administration or the Nixon – was it just different ends of the political spectrum? Monkman: Yeah. I mean, everybody hated the war, and I think it was very – toward the end of’68, Johnson was hated, Nixon was hated when he came in – I think the Nixon thing was even worse after Kent State. When that happened after Kent State, even the more moderate people were really upset by the Cambodia bombing and the Kent State thing. And I had a sister going to Kent State, going to graduate school at the time, so I got really upset. But, we had White House police and Secret Service around, plus then all the political people supporting the issue of the war and this and that. So it was very hard to make those transitions. If you’re in a different world or if you’re among other people who think so strongly about issues, you just kind of stop talking about work, completely – except for in the White House. We’d talk about it to ourselves. I would never talk about it to friends, even close friends. Monkman: The fierceness of opinion. And then even during Watergate we watched the newspapers every day. But even within the White House during the Nixon time, when those Congressional hearings started taking place, whew, everybody had an opinion about something. Monkman: We did have television; we did. We turned on the television to watch the hearings, I do remember that. Oh yes, people were glued to their television sets, even if they were little black and whites, or whatever. Smith: I have to ask you before we move on: did you have any contact with the Johnsons? Monkman: Yes. In fact, some of my best friends are still people I met in the Johnson administration. One was a secretary to Mrs. Johnson, who worked with Ashton Gonella, her personal secretary. And Bess Abell. I keep in touch with a lot, and Liz Carpenter. All those people, all their staffs, too – their press and their social staff. I think because I was very young and more impressionable at the time, and they were very easy people to work with. Even though people talk about President Johnson, Mrs. Johnson was extremely easy to work with. Smith: Everyone loved Lady Bird. Monkman: I remember years later I was down in Texas at this – maybe you went to some of those, those American Presidency conferences, the presidential libraries and the Parks people did. She invited us up to the ranch. So I’d gone though and looked at the house and I was kind of late. I guess everybody had gone down by the river to the picnic or something, and all of a sudden this young agent called me over to this van. They were taking Mrs. Johnson down to this picnic and she said, “Oh, Betty, come have a ride with us.” She never forgot people, and she was just so thoughtful. Very thoughtful. Whereas I remember other people coming, like carpenters, and people coming in who worked at nights or worked on the weekends, talking about Johnson roaming the house and screaming about the lights being on and all those stories. But Johnson was the first president I ever worked for and boy, he had this physical presence about him. He was tall and he was big, and he just exuded the – I’ve never felt any presence since him having that physical power about the presidency that I did with Johnson. Even though they were as large and everything, but there was just a force about him physically, I think. But I liked their staff a lot and it was just a very, very difficult time. Smith: One of the main things that most people don’t know about Mrs. Nixon is, she took an enormous interest in assembling historic furnishings for the White House. Monkman: But she did, she put a lot of effort into it, and she supported Clem Conger. He took the bull by the horns and really ran with her support. But she would sit down and write personal, handwritten letters to anybody who donated an object or even funds for a particular project or something. She received them, had their pictures taken, she would even walk them around on tours. There was an architect we worked with from Georgia, Edward Jones. She grew very close to his family – would have them for dinner. She would put herself out for that tremendously, I think. And she was very supportive of all of us. Smith: It’s a side that the public never really saw. Monkman: No, and I think they only saw her when she was out in public and she could be a little stiff out in public – reserved and a little maybe watchful. But when she was in the House, and when she trusted you, then she was very amiable to talking and [was] friendly. Smith: You saw her smoke? Monkman: I never saw her smoke, like Laura Bush, who….I’ve seen her smoke. Monkman: We knew she smoked, but I really didn’t see her. Up until the early Clinton administration, we had ashtrays all over the White House for parties and receptions and things like that. It was only since the ‘90s that people had to go stand out on the North Portico, and now I’m sure not many people do that to have a cigarette anymore. But I liked her a lot and I liked Julie a lot, too. She lived there for quite a while, from time to time, she and David. She was very involved with tours for the blind and she would come into the office and want particular information, or what can they touch. Whereas Tricia was distant and removed. She even would put across her bedroom door wires so that she would know if the maids came into her room, or anybody came into her room. She was very, very different than Julie. Monkman: And it was all so close in time, too, wasn’t it. I mean, his resignation – what year was that? Was that ’74? Smith: It was October of ’73 he resigns, and within days, Nixon announces Ford, and then within days comes the Saturday Night Massacre. In the same month of October, you had Agnew resigning on the 10th, Ford was announced on the 12th, and then within ten days came the Massacre. There must have been this sense of events accelerating. Monkman: Yeah, especially that Saturday Night Massacre. I think I remember that. It was a Saturday night, I remember. It was on the news, we were watching those talk shows with Hugh Sidey and some of those other people. But, boy, yes that was a very traumatic, dramatic time. I don’t remember much about Agnew, actually. I would see him coming or going, but at that time vice presidents didn’t have offices in the West Wing. They had their offices in the EOB. So, unless they were coming over for a meeting or a function or an event, you didn’t see them too often. Smith: I think you’ve already answered this, but was there a sense of the place under siege during those last months of the Nixon presidency? Monkman: Oh yes, and it got worse and worse. After that Supreme Court decision about the release of the tapes – I think I was away; that was in July and I came back at the end of July – and it was so tense around there. I would come home at night and my legs would just ache from tension. From being there. I remember one day, it was a week or so before Nixon was resigning, they decided to go on the Sequoia down the Potomac, and they wanted all the staff to go out and wave goodbye and give support to him. I just couldn’t go out there. I just stayed in my office. They wanted that public support of him. And I remember, even within a day or two before he resigned, and I would see one of Mrs. Nixon’s staff or somebody in the hall, and I would say something about I’m so sorry this is all happening, and they said, “Oh, we’re staying. We’re not going anyplace.” I mean, they did not believe that he was going to resign. And I thought there was just kind of a denial. Smith: A bubble within a bubble? Monkman: Like a denial that this could be happening. And I remember we’d have people calling us from all over the country saying, “What’s going on?” as if we…Finally, I think it was the day before he was resigning, one of our operations people who move our furniture said, “Oh, Mrs. Nixon has called for some packing boxes.” And then we knew that they were getting ready. They couldn’t take very much within a day with them, but enough that she could pack up a few things to take when they left the next day. Yeah, it was very tense, very tense. And none of us really knew anything, we really didn’t know. Nobody knew, right, until the last day or so? But, yeah, it was very tense. Smith: Were any of you consulted – because, of course, this was also the time when the vice presidential residence is about to be – was there any consultation on that? Monkman: Yes, we went out there. I was thinking that. The first time I ever met Mrs. Ford was in July of that summer. Clem Conger and I went out because they were trying to decide what to do with the Observatory Circle house – the Admiral’s house. And so we walked around with Mrs. Ford and we talked and we discussed whether she could borrow things from the White House storage facility. Mr. Conger still ran the diplomatic reception rooms of the State Department, so he was going to plan to lend some things from there to the vice presidential house. Monkman: I think the Admiral had moved out so there were some things there, but it certainly wasn’t set up for them living there, or entertaining there, because I do remember the State Department was going to lend them a dining room table for instance, and things like that. And there were no paintings or works of art. It was kind of a vacant place. Smith: But it was very clear she assumed they were going to be living there. Monkman: Oh, yes. And I think we went out there a couple of times because the Navy was involved and so forth, too. She was going to go up to New York and meet with people about fabrics and furniture companies, and this and that. So very clearly, this within less than a month before this all happened, they were still planning that move. Smith: And there is that famous story the day, I think it was the first of August, or a week before the resignation, the day Haig informs the Vice President about the smoking gun tape. And basically, the message is, it’s only a question of time. And Ford has to go and pretend – he goes with her to look at the house, because if he doesn’t, he knows the press is going to be all over him. Monkman: Yes, they have to. Smith: And then, as if that’s not bad enough, and he can’t tell her – they had dinner that evening with Marianna Means, and they couldn’t say anything. It was at midnight when they got back to the house in Alexandria, and she’s going on about the house and he says, “We’re never going to live in that house.” And that was the beginning of the final chapter. Monkman: Oh, wow. So it was just a week before that he was even aware that the situation was. Well it was very difficult because we knew, like so many of the staff, like Rosemary Woods. She was a very good friend of Rex’s – to see her with that photograph of her trying to reach that tape and so forth. You have to sympathize a lot with the staff, too. Some of them like Rosemary Woods had worked with him since his Senate days or longer, too. I think it really affected a lot of people’s lives after that. There were some people like Steve…. Monkman: Steve Bull. He was the nicest person, and they would come back for events later on, maybe when Mrs. Nixon’s portrait and the Nixon portrait or something like that, and we’d see some of these staff people. It was good to see that some of them survived and went on with their lives. But then I often thought about some people like that man who ran the re-election committee, who later became a minister. Monkman: Jeb Magruder. He was the most handsome young man. You would see him all the time and would think, “How could he have gotten himself into that mess?” You really see people – I think I became much less judgmental about people, because you really saw them as human beings. And even though these actions took place, you could be sympathetic to them, in a way, too. Smith: Sure. Well, you develop empathy, at least. Were you in the East Room on the morning of the 8th? Monkman: I went up there, but the room was packed, it was just packed, and I was standing by the door near the staircase as you walk up the staircase from the ground floor. I couldn’t see anything because there were so many people in there, and a lot of people had to stand. So I went back down to my office and watched it on television because I could see, at least. But I did go out as they were leaving because so many staff were out on the grounds then. But then it was just after the Nixons left there was this calm, quietness in the house. It was just eerie because all the Nixon staff people had left the residence and the grounds and so forth, and then we were waiting – we knew that the ceremony would take place again – it was at noon or something, it was shortly after noon. But there was this utter emptiness in the house. It was very, very strange. And I remember I’d hoped to go up and see the swearing in, but the police said no, there are only a certain number of people that are going to be allowed to go up. So we didn’t go up. But it was very – I think everybody breathed a sigh of relief, for one thing – I mean that this trauma was literally over with. But it was so emotional, too. Everybody was really drained, I think by that time. Smith: One thing we’ve heard from several people, variations of a theme – it’s perfectly understandable when you stop and think about it – was after the swearing in there was a receiving line and then I think there was a reception down in the dining room. And you could watch the Nixon people peel off. You can understand it, but that raises a larger question. Just from your observation, how difficult was it to sort of mesh the existing staff with the new people? That must have been a little bit of oil-on-water. Monkman: Well, not particularly. And I’m more familiar maybe with the East Wing staff than some of the West Wing staff, but I know that there was a State Dinner coming up within a few weeks. Was it the Shah of Iran? Monkman: King Hussein, yeah. And I remember, Mrs. Ford literally had to rely on Mrs. Nixon’s staff. Lucy Winchester was still there. But there is that permanent staff that works there, too in the House, and so they stayed. They would give the support to the incoming family. I think there were some real issues in the West Wing. I mean, some people did leave, and some people gradually left or whatever. Smith: Rumsfeld – it’s interesting because Rumsfeld, when he came in, pressed the President to clean house much faster. But Ford didn’t want to tarnish the vast majority of the Nixon people. And it’s a fascinating sort of case study in learning to be president. In some ways, Rumsfeld was right. In some ways the good of the country, the good of the presidency requires a certain amount of ruthlessness in this situation, and Ford, being Ford, and being a Congressman and all of that, wasn’t inclined to kick those people out. Monkman: A lot of them did stay. Smith: A lot of them were very good, that’s one of the unfortunate hangovers of what happened. We’ve heard over and over again that the Nixon staff was very talented – with obvious exceptions – particularly in policy. What was your first contact with President Ford? Monkman: Well, I think I did meet him at the vice president’s – at the Admiral’s house then. I can’t remember exactly when they moved in. Smith: It was a week after. Monkman: It took them a while. Exactly. Smith: They stayed at the house in Alexandria. Monkman: At least a week, if not a little bit longer, I think. Smith: And there is a wonderful story. The first day that they moved in, he walks up to the West Wing and there is a Marine saluting, opening the door. And he sticks his hand out and says, “Hi, I’m Jerry Ford, I’m going to be living here. What’s your name?” Isn’t that typical? Monkman: I think the Fords were much less formal, more casual people than the Nixons. I mean, the Nixons dressed and sat down for dinner every night. Life was just on a different – well there wasn’t that casual family atmosphere. Smith: Understood. The story has been told by several people that Mrs. Ford, in her first days there, in the morning was walking, I guess on the second floor, and saw some of the staff and said, “Good morning.” And they didn’t reply. Eventually, she went to the usher and said, “Do they not like us?” And it was explained to her that it was just kind of different under the Nixons – you were not encouraged to speak to the first family. But the word went out that it’s different. We heard that they established – particularly the President – very good relations with the permanent staff. Smith: Nothing ritualistic about it. Monkman: No, exactly, as though it were expected. It was something that you knew he sincerely thought. And I don’t recall any other president ever doing that. I mean, they might have had everybody go through a receiving line to say goodbye or something like that, but this was a much more casual, much more heartfelt, I thought, relationship. But that was at the end of the administration. Monkman: What the barrier was. Monkman: That there wasn’t that separateness, in a way. Smith: But, again, Ford didn’t see a separateness, which is revealing. Monkman: Well, I was surprised. There was this kind of issue between Mr. Conger, who always wanted to tell you what to do, and Mrs. Ford. And so, I remember her secretary, her personal secretary, who I liked a lot, but whose name I cannot remember, came down one day and said that Mrs. Ford wanted to talk with me. She didn’t want to talk to Mr. Conger. And so I went up there and there was Mrs. Ford in her bathrobe in the West Sitting Hall, and she wanted to discuss having the wallpaper removed from the dining room with the Revolutionary War scenes, and whether that would be possible. And so, there she was in her bathrobe. I had never – I mean I have talked to many first ladies – but never in their bathrobe. It was like mid-morning, maybe 10:30-11:00 in the morning. It wasn’t 8:00 or anything like that. So that, to me, said something, too; that she felt so comfortable about herself and who she was. That didn’t make any difference whether somebody came to talk with her. Smith: And the story always has been that she found that wallpaper sort of unsettling, sitting eating and all these people shooting at you. Monkman: And it was dark and it was on the north side of the house and she wanted something light and airy. So we did investigate how we could remove it and called in people to give us advice and so forth. And it was removed and then it went back up. Smith: And then it went back and then it got removed again, I think. Monkman: Well, no, it’s still there. We couldn’t take it down the last time, during the Clinton administration. We put up kind of a scrim over it and then some fabric was hung on that because it couldn’t be taken down again. I think it went back up in the Carter administration, because Mrs. Carter had talked to Mrs. Johnson and she found out that there had been wallpaper on the wall and so then she asked us if we could put it up again. It’s still there, but it’s behind something now. Clearly, this was something she didn’t want Mr. Conger to say no, it’s not possible. She wanted an honest opinion. Smith: Is it safe to say that after as many years, and the historic relationship he had with the house and everything else, that you get a little possessive? Monkman: Well, yeah, and I don’t think he realized in ’74, when the Nixons were having to leave, that things were going to change. I remember still, honestly, it was that summer of ’74, walking with Mrs. Nixon and Mr. Conger around certain areas, and he was saying, “I’m getting these designs from Lennox for your china.” I mean, this takes two years to make. And the reality just wasn’t there in terms of the possibilities of things. But he had raised a lot of money, he had brought in a lot of things, and he just felt that his idea was the right way to go. I remember in 1976, he was still there in ’76 – well, he stayed for quite a while after that – there was this question of whether, during all those state visits in ’76 for the Bicentennial, whether the Queen of England would be a houseguest in the house. Mrs. Ford wanted the Queen’s Room and the Lincoln Room, and some other areas kind of fixed up because they were kind of down. So Mr. Conger went ahead with these plans without really taking into consideration what she really wanted, and she was so angry. I remember, we got a call about these curtains in the Lincoln Bedroom and she had come back from a trip and saw them and she just did not want them, she had made us put back the old ones that were there, and so forth. So that created a lot of little – she just didn’t want to deal with him because he had very forceful ideas. He went ahead with his ideas without taking hers into consideration, let me put it that way, I think. Smith: Thinking more the museum than the home? Or the family residence? Monkman: Yeah, and not really thinking that they had an opinion and they lived there. It was their house. Eventually, it happened the Queen didn’t stay in the house. I think her staff, and she maybe, what had happened in ’39 when the King and Queen of England had under the Roosevelts, and the retinue that comes with them, and all the things that go on. So they ended up not staying there. But, nevertheless, that was something in the back of their mind, I think they thought about. Smith: Do you remember the time of her breast cancer surgery? One senses that it was a bit of a shock to the country. Monkman: Yeah, because I think it was so unexpected, but I knew that she hadn’t been well. We have this advisory committee, the Committee for the Preservation of the White House, and meetings would be scheduled and she wouldn’t attend. I remember during the ERA Amendment, there would be things scheduled in the theater with her press secretary and other people, and Mrs. Ford would be supposed to attend and she wouldn’t. So we were clearly aware that she had some health problems. But I don’t think anybody knew about the breast cancer. At that time people didn’t talk about it, either. The recuperation was much longer than it would be today. That’s some thirty-some years ago. But I think people really admired her forthrightness about that and about other things, too. We all loved her. She was really very down to earth. Monkman: Yes, but we appreciated that after this kind of tight, closed White House that we had experienced. For all the little controversies of things, she had a little vitality about her, I think. She does still have a vitality. I don’t know how well she is these days, but she was a very vital person, I thought. Smith: In some ways it’s a case of opposites attract, because she would needle him, very lovingly, and he would egg her on. She was not punctual. That was the one thing under the best of circumstances – there was Betty-time and there was someone else’s time. And he was the most punctual of people. But they learned to work around it. The whole Bicentennial must have been an enormous challenge. Monkman: And it was the campaign year, too, on top of that. So all of that travel and all of that – but it was a very busy year in terms of entertaining and all those arrivals, and even the year before when the Emperor of Japan came. That was a huge thing to have the Emperor come. You know, when you work there over a lot of years and administrations, you don’t go out for every arrival. They are kind of one like another. But the Emperor of Japan was such a historic figure you had to go out and watch that ceremony on the lawn. The staff gets very tense, her staff, his staff, everybody, when some of these really important heads of state come, like the Queen or the Emperor, or Gorbachev in the Reagan administration, because they are so unusual and they’re kind of historic figures. Smith: The famous incident with the Queen’s visit and the band and The Lady is a Tramp – were there repercussions after that or was it talked about? Monkman: Well, I think we all kind of laughed about it, because it really was the Marine Band that was playing the music. It wasn’t anybody else. It was after the dinner, because the dancing was in the dining room. I think the dinner had been in the tent in the Rose Garden. Smith: And the Fords loved to dance. Monkman: Yeah, and they had taken the carpet out of the dining room and removed all the furniture, so they used that room for dancing. But that was the music people, I don’t think anybody had pre-selected on the staff, or anybody had pre-selected the music. I think they were very careful after that as to what they played at a particular time. She probably laughed about it, too, in the end. I’m sure Maria, if she were the one in the charge of the dinner, had some qualms about it afterwards, I never asked. Monkman: That happened on a Sunday, didn’t it? That pardon? Because I remember hearing about it. I wasn’t at work when it happened, I do remember that. But I think there was this sense of “Here we go again,” about a controversy, because that was the really big controversy of his administration. Having worked there for so many administrations and so long, you realize they all come in so hopeful, so hopeful. And they all leave – all of them – other than Reagan, maybe, who stayed there eight years and wasn’t up for re-election, and he had some clouds, too, in the later part of his administration. But it gets tougher and tougher and tougher as all the decisions have to be made. We clearly see this already with the Obamas. But this sense of hope and this sense of anticipation, and then the reality of both living there, losing their privacy – and I think that’s one thing I have to say for people that work closely with the family, either in the residence or on their staff – that was one of our major things – was not to invade their privacy. And to keep their privacy. And I think that’s why we all – we might have talked among ourselves about things – but we didn’t talk outside of work about a lot of things. Monkman: And he hadn’t said anything. Monkman: And the casualness of it. And I think, too, having someone like Susan around kind of kept them involved in the normal parts of life, too. To have a young daughter like that, and occasionally their sons. Smith: And she had her high school prom there. Monkman: David Kennerly, he would often be up there showing her how to use a camera, they’d be looking at photographs and various things, too. So it was just kind of casual. Smith: It seems like every White House family, I know the Fords did, why do they all fall in love with the solarium? Monkman: Well, it is a very private space, I think. It’s removed from everything. People have to literally walk into that room. Unless you’re a staff person that’s been asked to come up to that room, it’s a private space. It’s very airy, light, a lot of windows. Also, there is access to the outdoors. I think Susan maybe would lay in the sun up there. There is a terrace around there. And so it was kind of a real private space for them. It wasn’t formal by any means and it was fairly large. You could watch TV, you could play cards, whatever you wanted to do up there. It was kind of your space, I would say more so than a lot of other spaces. Smith: Almost like a family room? Monkman: Very much so, yes. And for them, it was, I think. Smith: Ike used to grill steaks outside. Monkman: Yes, on his cooking thing. There is a wonderful photograph of that, I think, of his grilling. I’ve seen it, too. I think a lot of families have felt that was a very informal space that they could relax in. And they did. For Susan and her brothers, it was just very close to where their rooms were, so it was easy for them to have their friends come in. There were little refrigerators up there and a kind of kitchenette where they could keep things for them to eat or drink, or whatever. So it was a very, kind of like your rec room in another house. Smith: Little did Mrs. Coolidge know what she was starting. Monkman: Except you had this gorgeous view, of course, looking out over the lawn and people could go up there and watch fireworks, the sunset, or whatever. It was a very appealing space for a lot of families. Smith: They came back in later years on a number of occasions. Monkman: For their presidential portraits, especially. Yes. In fact, I remember Mrs. Ford. Her portrait was hung down near our office on the ground floor, and we were standing there – I can’t remember if it was right at the time of the unveiling, or when she came back another time later – and she said, “You know, I always wanted to look like my portrait, and that’s why I had my plastic surgery.” I remember her so clearly saying that. Monkman: She was so forthright about it. She said, “I always wanted to look like my portrait.” But they had another portrait that she had, I think it’s still in their home in California; it was an enormous portrait of her. I can’t remember the artist’s name, but it was huge. It could have taken up that whole wall. It was kind of like in this pointillist style. Very nice. It was in the gown that she had worn for a State Dinner. But they hung that up on the second floor in the corridor, and I remember walking up there. There she would be, bigger than life. It was huge. But it belonged to them personally, and I think they still have it, because I don’t think it’s at the library. I don’t know whether they’ll keep it or just what will happen to it. I think she seemed to take things with a lightness about her, even with all the difficulties that I think she had with her health and so forth. But she did have a sense of humor about a lot of things. Smith: There is a wonderful photo – so emblematic of her – with that sort of fantail window, and she is so tiny, she is actually up on the sofa, looking at the residence, or the wing beyond. Monkman: Yeah, and the EOB through the window there. Smith: I assume most families spend – isn’t that a place where they congregate quite a bit? Monkman: Yeah, and especially before dinner. Yes, and the light is so wonderful there. There is another room adjacent to their bedroom, which was for so many years was used for the president’s bedroom. Actually, Johnson, Nixon, Kennedy, they all had these separate bedrooms. But the Fords did not and they turned that into a kind of sitting room/office for him. They would have a television in there, too, because there weren’t televisions in the West Sitting Hall, I don’t think. But it wasn’t quite as bright and airy a room as the West Sitting Hall where people would congregate. It was easier for the butlers to serve them supper. Monkman: It had been just a long tradition that there was always that separate room. It really was, up until the Fords, that that remained a tradition. Since then that Presidential Bedroom has always now been a sitting room, or like Reagan used it, as an office, too. The American public concerns itself with every detail, regardless. Smith: My favorite is after the Sixty Minutes interview. I’ve seen some of the correspondence. A woman from Texas wrote and was very serious about this, as well as passionate. She said, “You don’t understand the Constitution requires you to be perfect.” The perfect mother, the perfect wife, the perfect hostess. And she was dead serious. She was taking her to task for falling short of her Constitutional requirement to be perfect in all these ways, as this particular letter writer defined perfection. And there were a lot of letters like that. Monkman: Well, they write about everything. And Mrs. Ford did have her controversies at times. But, you never underestimate the American public, is what I say. Smith: I’ll never forget, because I wrote his remarks, and he practiced for weeks – the 200th Anniversary Dinner. Monkman: Oh, that was very, very moving. Did you write those remarks? Monkman: Oh, you did? Because I think of all the remarks that were made that evening, his remarks about living in the house and so forth, were the most moving. And people still talk about that. His remarks are still used and quoted in different publications and so forth. Oh, that was very – he did that very beautifully. Smith: Penny Circle and I were co-conspirators, because I would write the stuff and then she would make him practice. At that point he’d been out of practice in some ways – so she would make him. And we were so proud that night because he really did hit it out of the ballpark. Monkman: He really did. His remarks were delivered with such empathy, I thought, too. He did a wonderful job. Well, that’s nice to know that, Richard. You’re behind that. But that was very thrilling. It was a very strange evening, to say the least. Smith: Because it was right after the election. Monkman: And the first President Bush was there, and we didn’t know whether his son would be president or Gore. And I remember Mr. Bush was to go off to Spain or Europe or something, and he was going to leave early, but then he was delayed a while. But everybody was on pins and needles that night. But Mrs. Johnson was there. Everybody was there except for the Reagans because of his health. It was a very special evening. But President Ford’s remarks really hit the spot that night. It really did. Smith: That’s nice to hear. Was that the last time you saw him? Smith: He came back for his ninetieth birthday in the second Bush presidency, in 2003. Monkman: That was after I’d left. I left in 2002. So I didn’t see him then. But I did see Mrs. Ford out at the library – how many years ago was that, I wonder? At the First Ladies’ Conference. Was that 2000? Smith: Yeah, we did a program. Monkman: And I spoke. Then we toured that exhibit, I remember that. Monkman: So that was probably the last time I saw her, too, because then I had left. Smith: I wanted to make sure. You’d written some notes and I want to make sure we’ve covered them. Monkman: I think I’ve covered most all of them. Oh, I should mention – this is one thing that I really had to admire about Mr. Ford. This is in 1976. He was getting all these gifts from heads of state and so forth, and one of the things that the government of Italy gave him, was this little miniature of President Jefferson by Trumble. Smith: I’ve seen it. We borrowed it once for an exhibit. Monkman: We knew all those state gifts would go to the libraries, but we really wanted that miniature. The portrait gallery really wanted the miniature, too, so we did a memo to the President and he made the decision to let it stay in the White House, and we could lend it to various things. But I really appreciated that. And I think one other thing, a gift that year, although we really didn’t want it, but we took it – a couple of things. One was, the Polish government gave this huge portrait of Kosciusko, enormous. It wasn’t a life-portrait, it was a copy of a portrait. It was so big and it was not something we could hang in the White House. But President Ford decided that it should stay in the White House, so we lent it up to the Kosciusko home I think in Philadelphia, or something. And then there was another gift, I think the Shah of Iran – was he still around? Yeah, he was still around. It was a beautiful Persian carpet with an image of George Washington on it, which we still have in the White House. I think it’s in storage. But just to let you know that we do have some of those Bicentennial gifts that stayed in the White House. Smith: Couple of things to wrap up. Did you have any encounters with the vice president? With Nelson Rockefeller? Monkman: No. And I remember this whole thing about he didn’t want to live in the Admiral’s house, and then brought in all those very modern things. But we really didn’t have any contact. And at that time, I don’t think he had an office in the West Wing, either. Smith: No, he did not. Monkman: I do remember Mr. Cheney, though, who became his Chief of Staff. He was really not an easy person around there. And I remember when Mr. Rumsfeld left and Mr. Cheney became Chief of Staff, and he wanted some paintings for his office. So I took him down into our storage room and he was very abrupt and very curt. He made his selection, but he wasn’t pleasant about it at all at that time. Although other people that worked with him didn’t have a problem. I think maybe he was busy and this just wasn’t something on the day he wanted to spend much time with. I don’t know. Smith: I was struck when the President died and they had the service up at the Cathedral, and they went by the White House and the staff was out front. Had that been done in the past? I don’t remember. I guess you’d have to go back to Reagan. Monkman: I do remember – when did Mr. Reagan die? Smith: 2004, June of 2004. Monkman: Yeah, because I had retired by then, but I got a call from the Usher’s office saying that Mrs. Reagan had said that she would really like to have all of the residence’s staff go down along, I guess it was Constitution Ave. at 16th Street, because the cortège was going to the Capitol building. And so the Usher’s office called me and said Mrs. Reagan had requested that all former and current staff, if they wished, to go down there. It was a really hot day and I decided – I knew the crowds would be terrible – I decided not to go down there. But, that was her request. And then I think they stopped on that access with 16th – not really 16th – but the access there near the Washington Monument. And some people said that she waved to them and recognized some of the staff there. But for them to do it spontaneously, for Mr. Ford, I think that would be unusual. Many of us received an invitation to go to the service and I saw many people there that had worked in the White House during that time. So they were, again, very generous, and very thoughtful about doing that. Monkman: In terms of the country, he did bring this great sigh of relief to the country and I think all of us, whether we worked there or not, felt that he was a man of great integrity who kind of soothed the nation at the time it needed to be soothed. And to have a calmness and an honesty about him. So I think if he achieved nothing else, I think this sense that he brought that the country could go forward with an honest man of integrity. And we really needed that at the time. And for those of us who worked there, it was, I think, a real sense of relief that life goes on and there can be a lightness about life again and appreciation of things. It was a good time, considering all the other issues and things, but with the fall of Vietnam and all of that. That was a relief, in a sense, too, I think. It was traumatic, but it was a relief. So I think in a positive way, he’ll be remembered, don’t you?